Rome, 18 February – After a whirlwind of dynamic speakers, panels and deliberations, IFAD's 39th Governing Council has officially come to a close. During the last two days development leaders, heads of state and government representatives from all over the world discussed critical issues relating to feed security, nutrition and small farming that hamper growth and prosperity for everyone. The United Nation's 17 Sustainable Development Goals (SDGs) were a major focus on day one, which continued into day two. 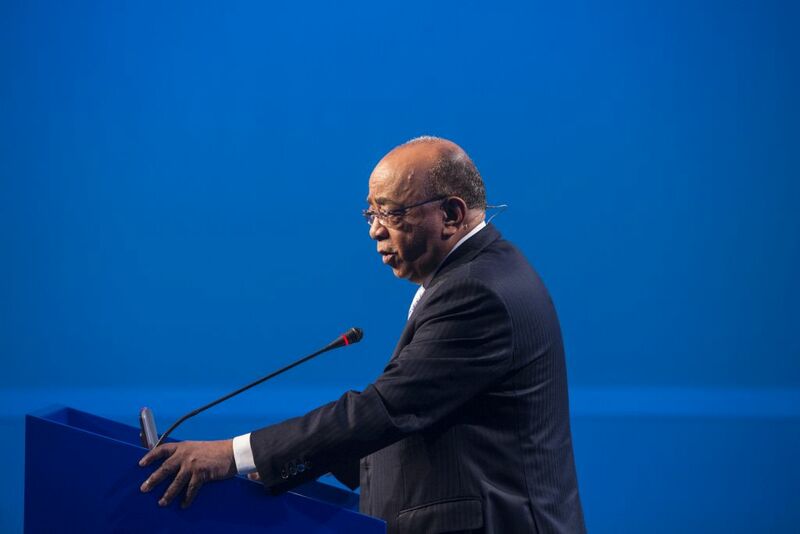 Dr. Mohamed Ibrahim, globally recognized entrepreneur and founder of the Mo Ibrahim Foundation, was featured in the IFAD Lecture that opened the session. Through its Index of African Governance, Ibrahim Prize for Achievement in African Leadership, Ibrahim Leadership Fellowships and other initiatives, the foundation promotes and cultivates good governance. A vibrant orator, Ibrahim did not mince words as he offered his analysis and opinions about the direction African countries need to take in the coming years. He noted that the continent is full of potential, and that "its richest resource is its people." However, according to Ibrahim, Africans themselves, and especially their leaders, need to take responsibility for the problems the continent faces and address them quickly. Africa faces poverty, hunger, food insecurity, and a growing population of young people that are leaving agriculture and rural areas behind. Ibrahim urged African governments to increase their investments in agriculture, noting that easy profits from oil or minerals caused African leaders to neglect the agricultural sector. However, this is not a sustainable practice since "people don't eat oil, they eat food," Ibrahim said. Ibrahim noted that 80 per cent of countries had not met targets made in the Maputo Declaration on Agriculture and Food Security of 2003, and that it was crucial that they live up to commitments to invest in agriculture. Though Ibrahim said there was no "silver bullet" to solve these problems, he focused much of his speech on good governance. Good governance is crucial for businesses and other organizations to invest in Africa, Ibrahim said. Businesses would not invest in an area that does not obey the rule of law. He listed a range of governance problems from corruption to poor taxation regimes. Though he conceded that businesses can "misbehave" as well, Ibrahim said that when business is a force for good, it creates jobs, prosperity, and innovation, all of which would transform the African continent. Ibrahim's speech was followed by a one-on-one session with Dr. Ismahane Elouafi, the Director General of the International Center for Biosaline Agriculture (ICBA). Elouafi started her speech with a warning: though climate change is now universally recognized, there will be grave consequences if we do not realize how widespread and damaging its impact is. "We have huge challenges ahead, and we need to act, " said Elouafi. Elouafi spoke about a broad number of topics, including gender equality and education. Elouafi was optimistic about the future, saying that she believes the SDGs are within reach. "I am confident that we can achieve the SDGs because the demand is there," said Elouafi. But to get there, much has to be changed. One of Elouafi's main critiques of how smallholder farming is approached concerned the flaw in research and development. Elouafi said that most research and development is carried out in the West and then applied elsewhere. She believes that, to produce the best results, development programmes must be devised where the problem is happening. "We need to have much more customized research and solutions for each region," she noted. Elouafi also spoke about how farmers are leaving agriculture because they are not being given the the opportunity to innovate or expand into new areas. According to Elouafi, in order to reach "the agriculture of tomorrow," we must continue to innovate. Moderated by Périn Saint-Ange, Associate Vice-President of IFAD's Programme Management Department (PMD), the panel featured IFAD experts discussing innovative investments in four different regions. Elizabeth Ssendiwala, the Regional Gender Coordinator for the East and Southern Africa Division, described how IFAD is addressing gender equality by looking at the household as a whole. In response to a question posed from the audience, Ssendiwala said: "Gender equality is not about empowering women alone, but rather every member of the household." Glayson Ferrari Dos Santos, Country Director for El Salvador, Latin America and the Caribbean Division, spoke at length about the youth in Central America and the problems they face. He believes that rural youth in El Salvador want to help transform the areas they call home, but are not often given the opportunity to do so. "Young people have to be part of the solution, and not seen as part of the problem," Dos Santos said. Concerning agriculture, Dos Santos said he found that the youth were willing to work in the industry, but they wanted to break away from traditional farming practices. Ronald Hartman, Country Director of Indonesia, Asia and the Pacific Division, agreed with this idea of doing things differently. He believed that, by incorporating new technologies, farming can be made more attractive, more efficient and less laborious. Hartman also spoke about working in Indonesia, and how changes in IFAD's structure allowed the conversation to shift from being all about finances to finding out ways to innovate and support the nation’s development strategy. 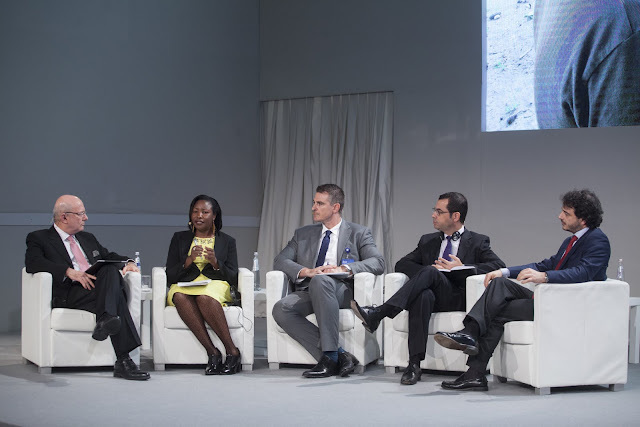 Jacopo Monzini, the Senior Technical Specialist for the Environment and Climate Division, also discussed innovation, focusing on the ways IFAD is using GIS and earth observation to get a clearer picture of land use and environmental degradation, scaled down to the project area. 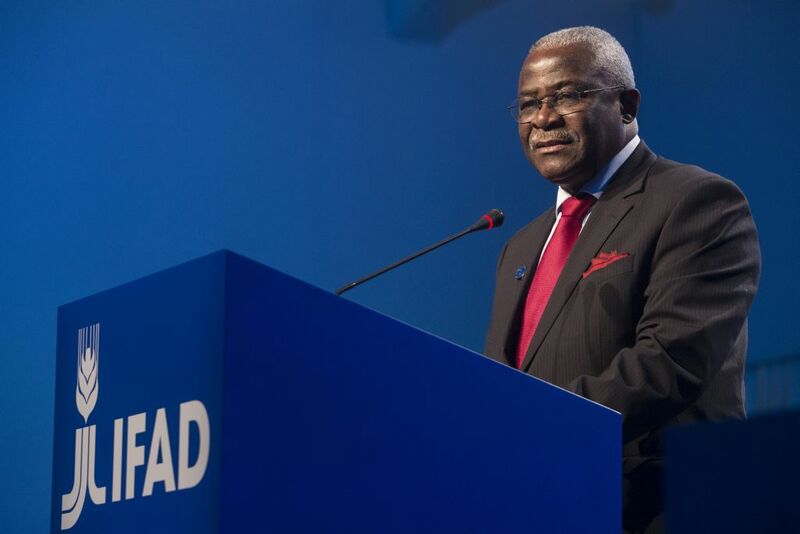 After the Chairman read a summary of the discussion in the Governor's Round Table the previous day, IFAD President Kanayo Nwanze delivered his closing statement. Nwanze thanked the governors and delegates for their time and devotion, and summarized the preceding of the last two days. Nwanze told the room that “by working together to deliver on the Sustainable Development Goals (SDGs) – starting with zero poverty and zero hunger – we can break the chain of desperation” that leads to emergencies and humanitarian disaster. Nwanze reminded us all that there was much more work to be done and that we must continue to work together towards long-term solutions. Or, as Nwanze aptly put it: "Our world is one world."